The option to send documents via email to your customers is active for all our subscription plans, including the free one. All you need is to confirm your email address upon registration. Once you confirm your email address, you can send your documents and estimates via the application. Please note that while sending draft invoices, estimates & credit notes is allowed, the document state will be automatically updated to "issued" afterwards. To send a specific document via email, you must click on the "Email" button, found in the document's display page. You are then transferred to a page similar to the image below. The system by default copies the contact's first email address saved as "Work". Clicking the arrow next to this field, you see a list of all the contact's email addresses to choose another one. You can also add a new email address from the "Use a new address" button. By checking the "Store the address on the contact for future use" box, Elorus will save the new address to the already existing contact. By default, Elorus uses the logged-in user's email address as sender. To use a different address, visit the "Settings-> Application settings" page and fill in the "Default reply to email address" field. Note that you must verify the address before it's actually used. Once the default reply to address is filled, it will always be used as sender, regardless the logged-in user. You may use this field in case you'd like to share the document with a third person by entering one or more, email addresses manually. After each email address make sure to press Enter, so they are submitted correctly. Alternatively, you can click in this field and a drop-down list will appear with all organization's users email addresses. This way you can notify your partners (e.g. your accounting department) that the document was sent via email to the contact. If you tend to always fill a specific email address in the Cc field, you can use the "Default Cc email address" setting (found in the "Settings -> Application settings" section), to have this address automatically pre-filled in the email form. Here you can enter email addresses that will receive a copy of the message, but the client will not be able to view their addresses. 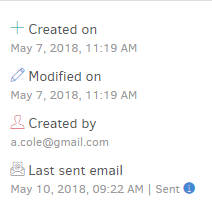 You can edit the email's message for all your future documents through the templates settings. You may also add additional information manually, per case. Each email message may contain the document's permalink so your customers can have access to it and proceed with its payment (you will have to include the document permalink variable inside your templates, first). Once the customer clicks on the document's link, Elorus will display a notification to your account that the customer has viewed the document you sent them. This information is then stored in the document's history. You can add additional attachments (unlimited in number) to send, using the "Attachments" menu conveniently located in each document's display page. The document's PDF file is attached by default. Note: Each attachment cannot exceed the 3MB in size. Each email can have up to 3 recipients, plus the number of the organization's users. For example, an organization with 2 users in total, can have 5 recipients per email. This limit applies to Cc and Bcc separately. So, in the previous example, you can enter 5 Cc recipients and another 5 Bcc. In case you need higher limits, you may contact us to extend them. 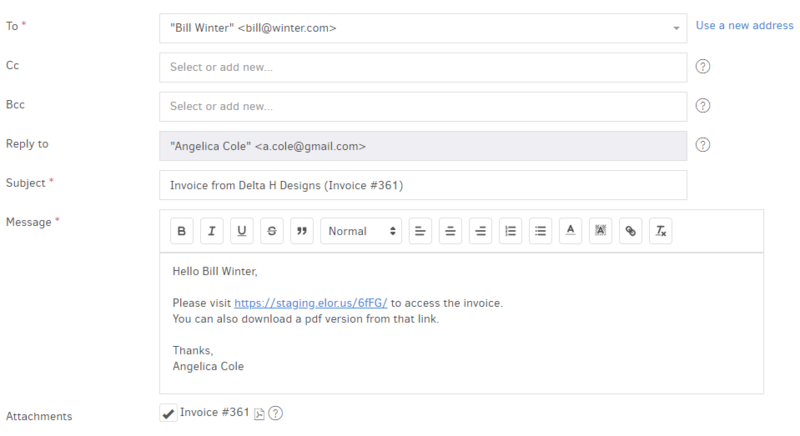 Via Elorus you have the option of sending your invoices in bulk to multiple recipients, just by following a very simple process. Once you press "Email", the messages will be on their way to your contacts' inboxes and you can track their status from the "Email history" option. The corresponding client contacts must have at least one email address. If any of the selected invoices does not meet the above conditions, the system will display a warning, but you still may proceed with sending the rest documents. Deferred: the message was delayed by in transit (e.g. because of a full mailbox, or certain spam-detection strategies etc). The ESP will keep trying to deliver the message. Rejected: the ESP refused to send the message. Please try again. The list inside the "Invoices" menu, if you check the "latest email" box in the "Columns" button. From each document's page, below the creation details. by clicking on the (i) icon you can view further details regarding the last email's status. Through each document's "More" button (the one with the tree dots) , select the "History" and you're provided with an "Email history" tab. As always, if you click on the "details" button you can see the exact email text that was sent, the recipients and any possible sent attachments. Note: You can see delivery information for the main recipients only, not the recipients of Cc & Bcc fields.